﻿﻿Wholistic Remedial Massage addresses the physical, emotional and energetic aspects of being. My intention is to use the ideal techniques to allow your body to unwind and release, as the physical structure relaxes, your mind and breath follow, calming the nervous system and support lasting results for the reduction of stress and tension. An initial consultation and treatment can be a 1 or 1.5 hour appointment where we discuss your intention for the treatment and which therapies will give you the maximum benefit. Each treatment is tailored to your specific needs utilizing a range of physical, emotional and energetic techniques. Yoga stretches, breathing techniques and specific guided relaxations are recommended to maintain the positive effects of your massage between treatments based on your desired outcome. Deep tissue massage uses the fingers, palms, forearms and elbows to apply a firm pressure and soften the layers of muscles and the connective tissues of the fascia- a thin web-like tissue that covers all organs, muscles, bones, tendons and ligaments. When the surface muscles fibres are warm and relaxed, access to the deeper tissue layers becomes possible to release long standing patterns of tension and increase mobility and circulation. At this level, stored emotions can arise contributing to a release of the physical tension patterns. Foot Reflexology treats the whole body through the feet based on the theory that the organs, glands, joints and systems (digestive, hormonal, nervous etc) have corresponding points in the feet. It is a safe, effective and non- invasive (clothes are left on) method that treats internally where massage treats externally. A full hour includes a foot and lower leg massage, or reflexology can be added to a Wholistic Massage session focusing on the areas that need it most. Relaxation massage ties the various elements of a treatment together using firm, flowing, soothing movements that calm the muscles in contrast to the discomfort that may be felt with the deeper techniques of acupressure, deep tissue and dry needling. The relaxation massage allows the body to soften and unwind before working into the deeper layers. Although the techniques are relaxing, they are not 'too' light as to feel ineffective but firm enough to increase circulation, warm muscle tissue and calm the nervous system, allowing the mind to switch off and be still. Acupressure uses the fingers placed on the traditional Chinese acupuncture points found on the meridians or energy lines on the body. When the points are out of balance they can feel dull (under-energized) or sharp (over-energized or blocked) which disturbs the flow of energy along the pathways diminishing the self healing and regulating ability of the organs and systems. Usually imbalances are found in areas of muscle tension or weakness, releasing these points reduces pain and restores energy flow so the body can heal and maintain itself more effectively. Massage can be enjoyed during all stages of pregnancy. It supports expectant mothers as their body grows and adapts, reducing swelling, fluid retention, heaviness, aches and pain. Massage also provides a time for women to nurture themselves as they nurture new life, to find stillness to connect with their unborn child, to gain focus and body awareness that will assist during birth. The 'Belly Pillow' support cushions make it possible to lie face down comfortably during a treatment and care is taken to apply the appropriate pressure and avoid certain areas according to the trimester of pregnancy. Originating in China, glass cups are vacuum sealed safely to the skin, drawing blood into the area, loosening the muscles from within. Tight muscles always have restricted blood flow, massage works from the outside to soften them manually whereas cupping increases circulation from the inside making the two together highly effective. Cups can rest on the same spot or be guided to gently slide across bands of tension to stimulate the whole area, particularly effective for the large and multiple muscle layers of the back and shoulders. Dry needling is effective for long term and deep patterns of tension as the needles can reach where massage is unable to, increasing the effectiveness of a typical massage treatment. 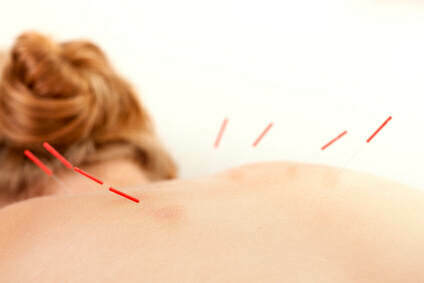 Medical grade fine needles are inserted into trigger points to release muscle and fascia fibres. Trigger points are intersections of tissue underneath the skin where tightness and tension can store and cause pain and discomfort. Dry needling is a purely physical technique, it does not work on the Chinese medicine model of energy lines (like Acupuncture and Acupressure does). Surrounding each of us and contained in every cell is a field of energy that interacts and influences the physical body and vice versa. Our subtle energy body is well documented in Eastern Medicine as energy meridians and the chakras. Emotions, thoughts, stress, food, electronic devices, people we spend time with, places we visit all effect our energy body. If a physical issue has originated in the energetic system then it needs to be treated at the source and in the right time the issue will arise to be resolved and balanced. Working at this level gives a feeling of lightness of mood, clarity, connectedness with self and life, a general feeling of wellbeing on all levels. Yoga postures extend and enhance the benefits of each massage treatment. A simple, tailored stretching plan empower clients to be able to manage pain, stress and tension as it arises in everyday life while balancing the physical, emotional and energetic aspects. It's a great way to centre yourself when you feel swamped by commitments and reconnect with your body and the present moment when you feel mentally overwhelmed. A massage treatment is also a perfect opportunity to experience a guided relaxation, and be introduced to basic meditation concepts such as breath and body awareness, stillness and observing the mind.